Fred Rogers was the creator of Mister Rogers’ Neighborhood as well as the host of all 895 episodes, the composer of its more than 200 songs, and the puppeteer who imagined 14 characters into being. More importantly, he changed the face of children’s television and transformed the way we think about the inner lives of young children. Throughout his career, Fred Rogers was a champion of children in general and PBS in particular. In 1969, he famously testified before a Senate subcommittee that was considering cutting funding for public television. Senator John Pastore was in charge of the proceedings, and after two days of hearings, he remained distinctly unimpressed. Then Fred spoke. This is what I give. I give an expression of care every day to each child, to help him realize that he is unique… I feel that if we in public television can only make it clear that feelings are mentionable and manageable, we will have done a great service for mental health. With Josie Carey on "The Children’s Corner"
While a college senior studying music composition at Rollins College, Fred arrived home to see this wonderful new technology in his family’s living room. He instinctively understood the power of the new medium and especially how it could be used to serve children, rather than the slapstick and nonsense that was on the air. From that moment, he knew what he was called to do. Rather than pursue studies in theology as he had planned, he began a television career as an assistant and floor manager of the music programs for NBC in New York City. But he soon discovered commercial television was not for him. In 1953, he moved back to the area where he grew up to help found WQED in Pittsburgh, the first community-supported educational television station in the country. Behind the scenes on "Mister Rogers' Neighborhood"
Fred didn’t set out to be a star of a TV show. He was a private person, comfortable in the background as co-producer, puppeteer and organist on The Children’s Corner, which aired on WQED from 1954-1962. While serving as both the program manager for the station as well as working on The Children’s Corner, he returned to his interest in theology and attended Seminary during his lunch hours. He was ordained with a special charge to serve children and families through television. In 1963 he moved to Canada, and there at the CBC, he was given the courage to come from behind the set to talk directly with his young viewers as Mister Rogers. He returned to Pittsburgh and launched the present-day version of Mister Rogers’ Neighborhood in 1966. The program aired for the first time nationally in 1968. With graduate studies in child development as well as his divinity degree, Fred was well-prepared to speak directly to his pre-school audience. Fred Rogers was married to his Rollins College sweetheart, Joanne Byrd Rogers, a concert pianist who shared his love of music. Their two sons, James and John, were occasional visitors to Mister Rogers’ Neighborhood. In 1971, Fred founded his own production company, Family Communications, to produce Mister Rogers’ Neighborhood and related materials for children, families and professionals. 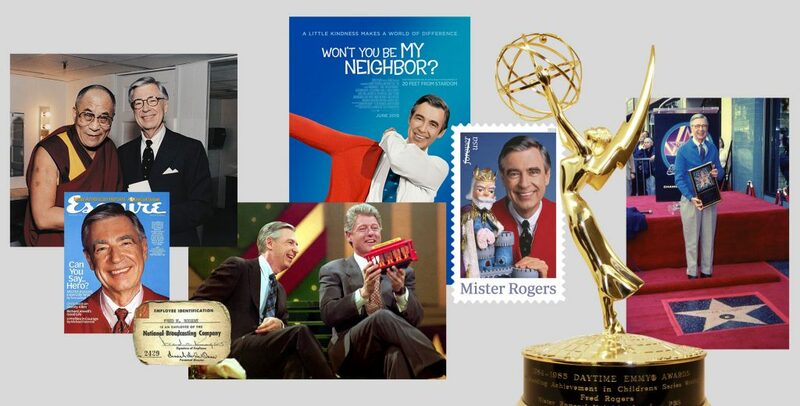 Fred Rogers’ relentless commitment to all that is best in people led to an astonishing range of honors, from induction into the Television Academy’s Hall of Fame to the Presidential Medal of Freedom. He was awarded more than forty honorary degrees. I feel that those of us in television are chosen to be servants. It doesn’t matter what our particular job, we are chosen to help meet the deeper needs of those who watch and listen – day and night! 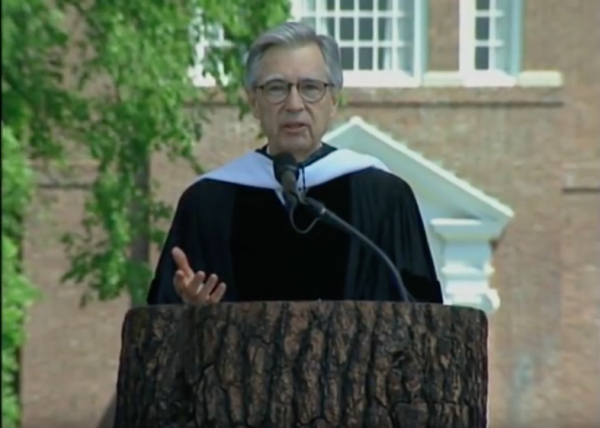 In 2002 at Dartmouth College, Fred gave his last commencement speech. As he often did in those days, he offered those assembled an invisible gift of a minute of silence to think about those who had helped them become who they are. Fred Rogers died in 2003. He is survived by his wife of 50 years, two children, three grandchildren, and generations of viewers for whom he envisioned a better world. I’d like to be remembered for being a compassionate human being who happened to be fortunate enough to be born at a time when there was a fabulous thing called television that could allow me to use all the talents that I had been given.